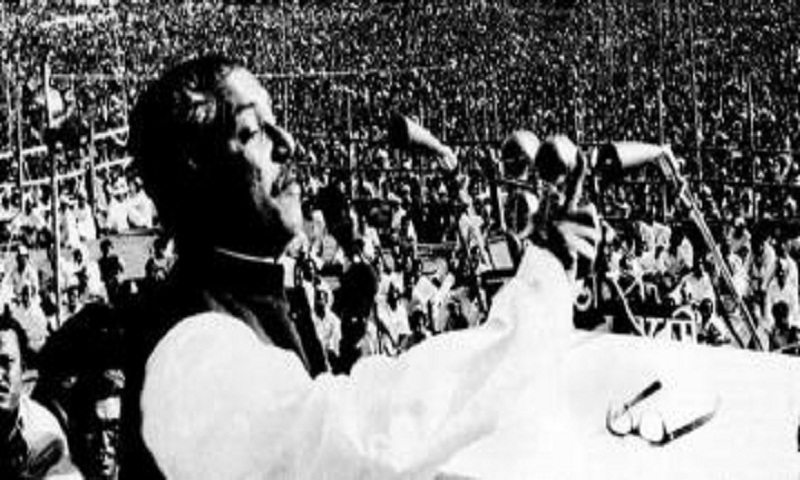 The nation is set to celebrate the UNESCO recognition of the historic March 7 speech of Father of the Nation Bangabandhu Sheikh Mujibur Rahman in a befitting manner across the country on Saturday. Cabinet Secretary Mohammad Shafiul Alam said this while addressing a press briefing held at the conference room of the cabinet division on Friday. As part of the celebration, jubilant processions, essay and quiz competitions and screening of films on the Liberation War will be held at all the 64 districts, upazilas as well as the capital also. Bangladesh missions abroad will also hold the similar programmes, said the official. "The government has decided to celebrate the programme as the UNESCO recognised Bangabandhu's historic 7 March address as a world documentary heritage which is a great achievement for the entire nation," said Alam while briefing to the newsmen. In the capital, the day-long celebration will begin at 12 noon through placing wreaths at the portrait of Father of the Nation Bangabandhu Sheikh Mujibur Rahman at Bangabandhu Residence located at Dhanmondi Road-32. Later, a procession from the residence will move towards Suhrawarty Uddyan where Bangabandhu delivered the landmark speech in a mammoth gathering on March 7, 1971. Noted politicians, lawmakers, freedom fighters, cultural personalities, cultural activists, government officials and employees, sports organisations, renowned sportsmen, representatives from Shilpakala Academy, representatives from Sammilito Sangskritik Jote, representatives from NGOs, scouts, rovers, smartly turned police horse contingent, beautifully-decorated horse carts, band parties of police, personnel from Border Guard Bangladesh (BGB), Ansar and VDP and people of all-strata will also participate in rally. Prime Minister Sheikh Hasina is expected to address a grand rally as the chief guest at 3 pm at Suhrawardy Uddyan. Following the address of the Prime Minister, cultural function and leaser show will also be held at 4pm and 5.30pm respectively, Alam told the journalists. Besides, the district and upazila level programmes will begin at 10 am through placing wreaths at the portrait of Father of the Nation Bangabandhu Sheikh Mujibur Rahman in the respective areas. Apart from this, educational institutions across the country will organise essay, quiz and general knowledge competitions marking the great achievement. Bangladesh Television, Bangladesh Betar and private TV channels will air the programmes live while newspapers will publish special supplements on the day. The historic 7th March speech of Father of the Nation Bangabandhu Sheikh Mujibur Rahman has been included in the Memory of World International Register, a list of world's important documentary heritage maintained by UNESCO. UNESCO formally recognised the historic 7th March speech of Bangabandhu as part of the world's documentary heritage by the announcement of the Director General of UNESCO, Irina Bokova, at the UNESCO Headquarters in Paris on October 30, reports BSS.